anlabyhouse: Block for Katrina Hurricane relief. It is so good to be blogging again after so long away handling real-life situations. 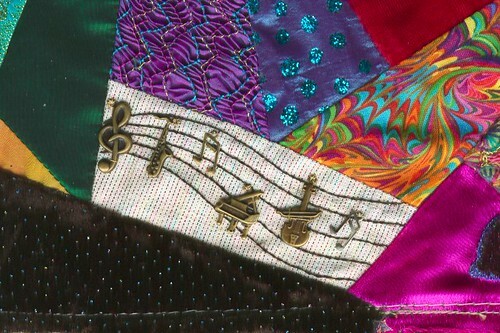 I have to thank Sharon Boggon from inaminuteago for inviting me to be a participant in the Crazy Quilt to raise money for the American Red Cross so they can help victims of hurricane Katrina. Now I'm revisiting my much neglected blog as I use it to record my progress on my block. I couldn't wait to get cracking on the block so immediately created a little notebook so I can record my ideas and draw my various stitch combinations before I jump in with needle and thread and find out that it doesn't work! My photos show my notebook open at the "colours" page where I glued pictures cut from the internet, from clip art, magazine cuttings and pieces of fabric. Then I took a good hard look at the pages noting that I had quite a lot of turquoise, not much yellow, a small area of orange, a bit more hot pink etc and I tried to keep the colour combination on the block to the same proportion. This photo is of my first completed patch - my Jazz piece! It is simply five lines of black stem stitch with a row of musical charms dancing along them. I think the charms were meant for scrap-booking but they were perfect for my block. Welcome Back - we have missed you - the world is not such a colourful place, without your blog. I loved seeing your notebook - I hope you post more pages! Your block is looking good too! I love that piece of smocking in your block! Don't see that very often. Very imaginative piece of piecing! Thank you for sharing the design process.